Who said ‘Friday the 13th’ was unlucky!! 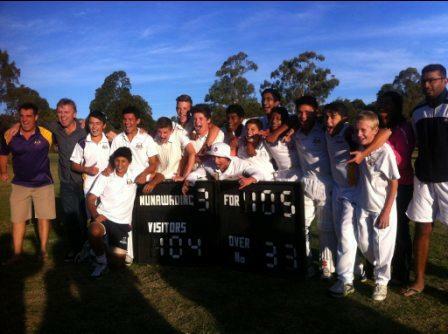 Our U14 boys were chasing 104 to win their Grand Final. After losing three early wickets to extremely good catches by Blackburn fielders, Aditya Munukutla joined opener Josh Richardson at the crease. The scores had been 1/6, 2/8 and were 3/16. The two boys batted beautifully and chased down the total to bring up a well deserved win. Josh finished 36 not out, and Aditya 53 not out. This was a great team effort by all 12 boys – and one that was acknowledged by the umpires and opposition in the post match presentation. As Buddy said after the match, the boys played their best cricket all season in the semi-final and Grand Final. It was also the first junior premiership for Nunawading since Dave Cowell (Club President) restarted the junior program some 8 years ago!! It was great to see so many faces at the club last night supporting – and also to see so many other junior families helping out on the night. Thanks to Jean-Paul Lefebure and Cam MacPhie for cooking the BBQ, and also Max and Pat for running the bar as they always do.